Can you tell I've missed my kitchen? Back to back recipes when I hadn't posted one in weeks. I loved our Christmas vacation, but I couldn't wait to get back into my kitchen and start cooking, again. It's so calming for me and I love creating dishes that make my husband happy and my kids smile. This recipe is one I've worked on and tweaked over the last few years. I love puff pastry. Well, I mean, really - what is there NOT to love about puff pastry? Layer upon layer of pastry dough and butter that puffs up into an airy, flaky somethin' somethin' that will make your eyes roll back into your head with its goodness? 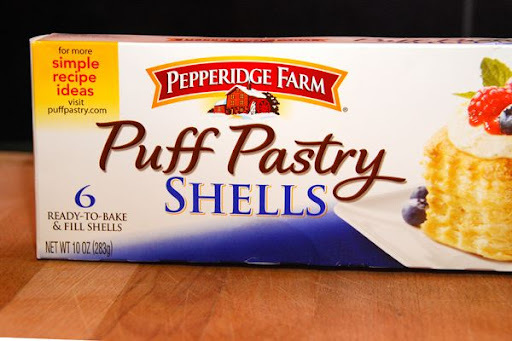 The heavens opened up and sang the day someone thought of puff pastry. This is a great weeknight dinner recipe. It's very, very easy, but almost entirely homemade. I have never tried to make puff pastry from scratch - mostly because it's so easy to buy frozen and it turns out perfect every time you use it. 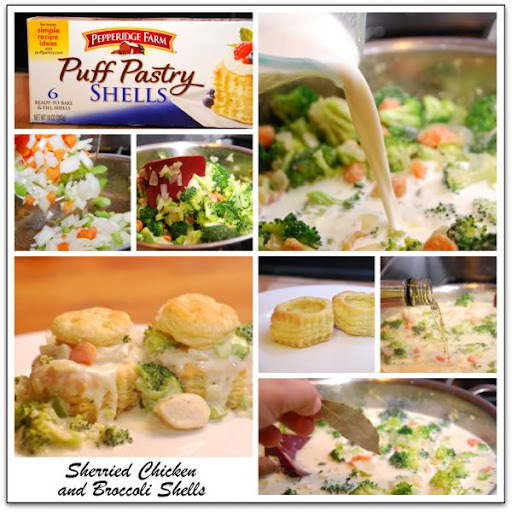 For these Sherried Chicken and Broccoli Shells, puff pastry shells are filled to overflowing with a creamy chicken and broccoli sauce. At the end, you douse the sauce with sherry - and it gives it just the right touch to take it from ordinary to absolutely divine. Roast some chicken breast or sauté it in a pan. Either method works great for this recipe. You could also use a store-bought rotisserie chicken and just shred the meat. How easy is that? 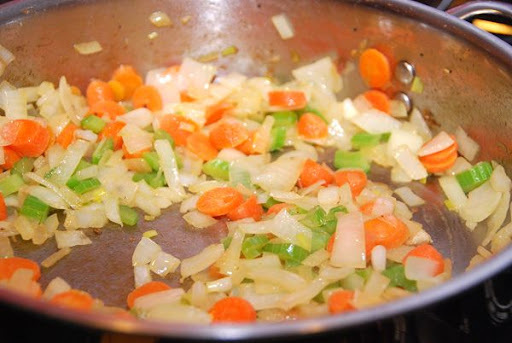 Once the chicken is prepared and set aside, add 3 tablespoons of butter to a sauté pan and add chopped carrots, celery, and onion. 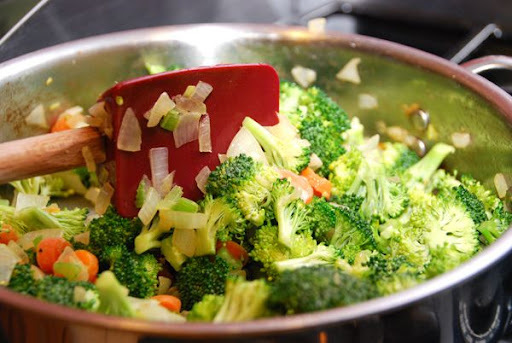 Sauté for 10 minutes, or until vegetables are soft. 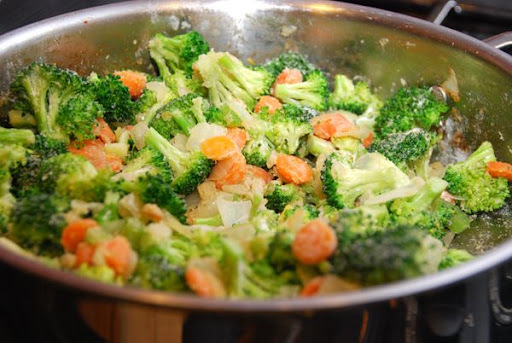 Next, add one head of broccoli florets (cut into small pieces), and coat with vegetables. Cook for 3 minutes. 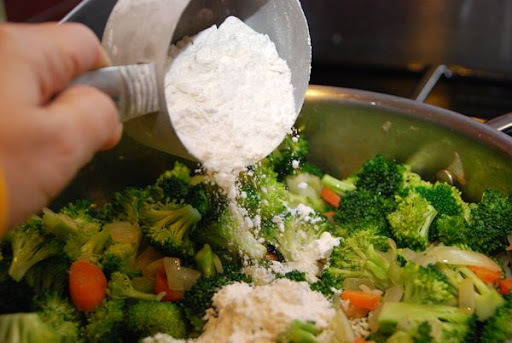 Sprinkle 1/2 cup of flour over vegetables. This is what the vegetables should look like once the flour has cooked through a bit. 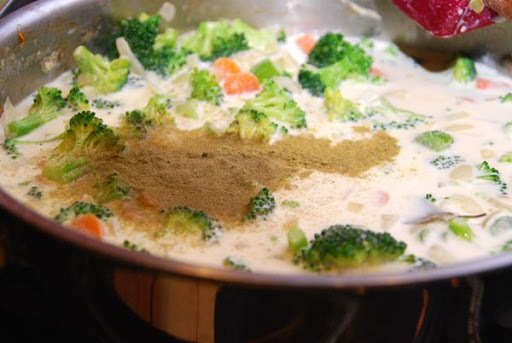 Add 2 cups of chicken stock and 2 cups of half and half to the vegetables. Oh, half and half, how I love you. 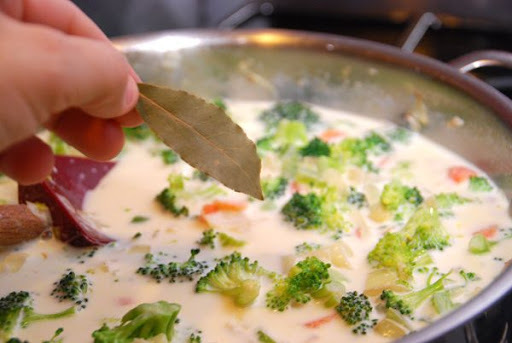 And 1/2 teaspoon each of marjoram and thyme, and cook until broccoli is tender. Add the roasted or sautéed chicken into the pan and stir to combine. 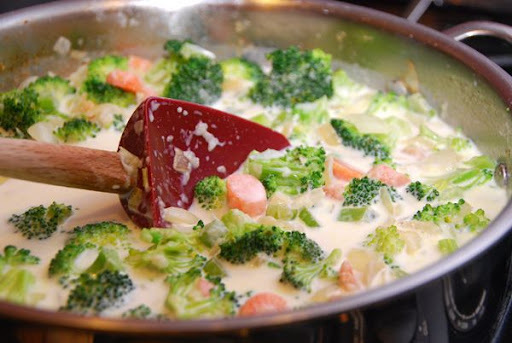 Cook for 5 minutes more until the sauce combines and thickens into creamy deliciousness. 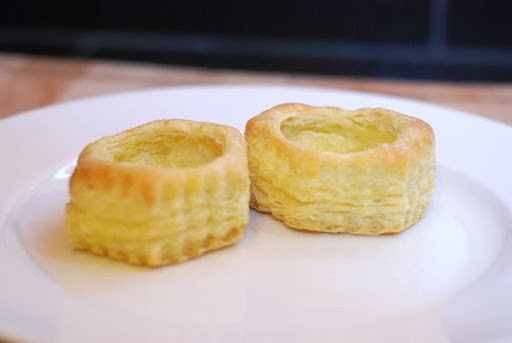 When ready to serve, remove the tops from the puff pastry shells. (They pop right off.) Place two puff pastry shells on a plate. Ladle sauce into and over shells. Be generous. Very, very generous. Lastly, place tops on the shells. They're like little hats. 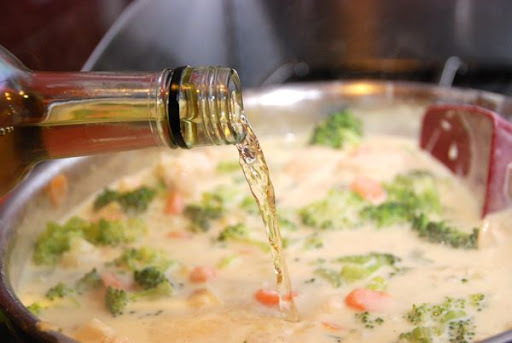 And, with that, you have Sherried Chicken and Broccoli Shells. 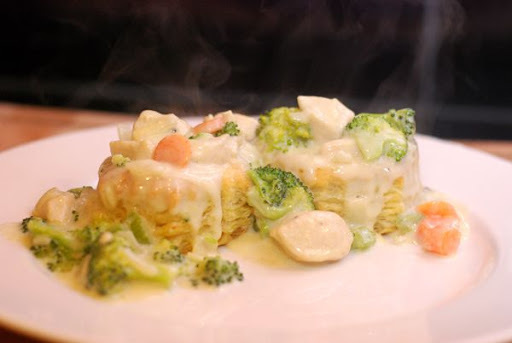 A delicious, creamy, savory dinner that your whole family will love. While shells are baking, melt butter in large sauté pan. 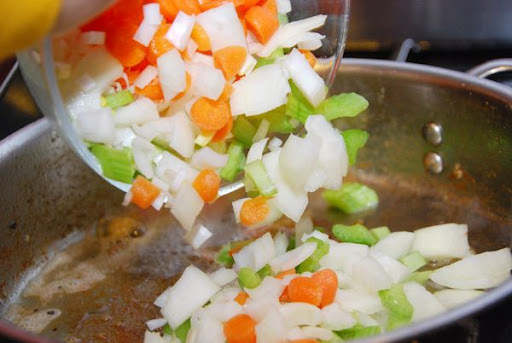 Add onions, carrots and celery. Cook for 10 minutes, or until onions are translucent. 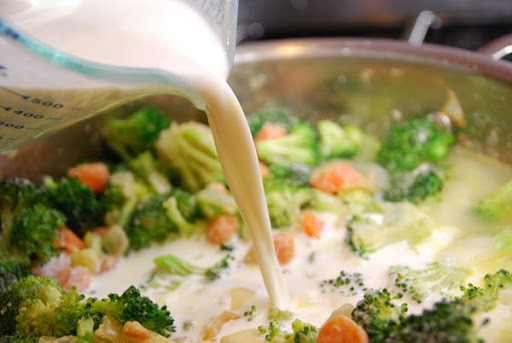 Add broccoli and cook an additional 3 minutes. 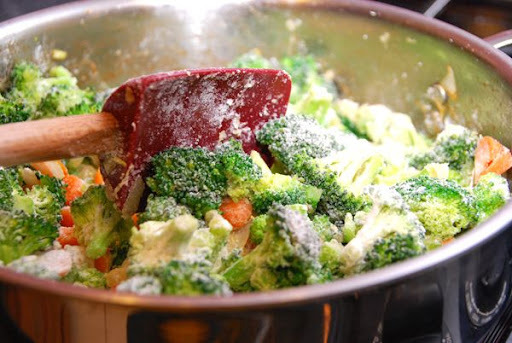 Sprinkle flour over vegetables and cook for one minute. Add chicken stock, half-and-half, bay leaf, marjoram and thyme. 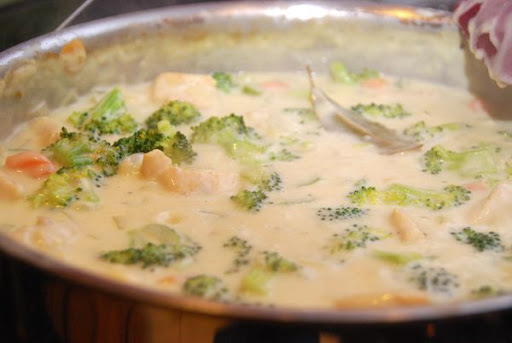 Cook on low until sauce thickens and broccoli becomes tender. 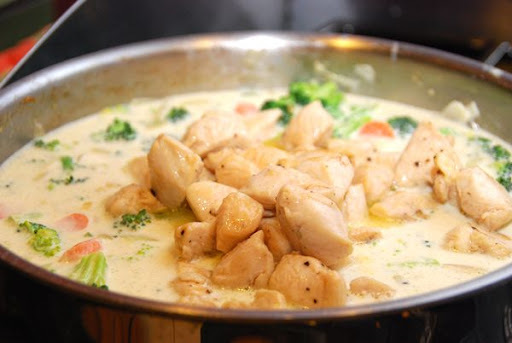 Add chicken and sherry and cook an additional 5 minutes until chicken is warmed through and sauce is thick and creamy. To serve, ladle sauce into and over baked puff pastry shells. Place tops on each shell. *Note: This makes 12 shells - enough for six people to have two shells each. This recipe can easily be doubled or halved as needed. Sarah, I always love your recipe posts! Your photos are so gorgeous. What kind of camera do you use? I am looking to upgrade soon. Thanks - can't wait to try this out for the family! Beautiful pictures that explain each step; I will make this on Saturday. Thank you! or some kind of milk? TWO recipes that look like pure deliciousness. Thanks! Oh my goodness...I just saw the comment above mine. What's half and half?!?! Bah ha ha!!! Love it! 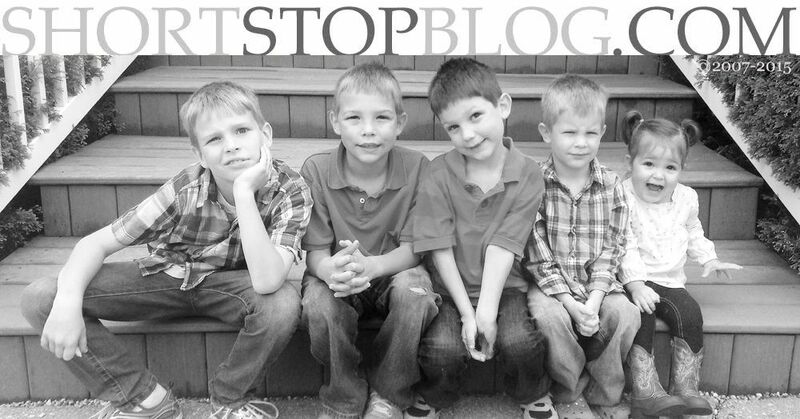 I know you are one busy momma & raising your kiddos is #1. Thanks for the recipes. I love your step by step with photos. You always make me feel like, "I could do this." It looks so yummy. I wrote a post title, "Lights, Camera, Lenses" about all of the photography equipment I use. It's on my sidebar under "My Photography Equipment. Yes, half and half is like light cream. It's actually equal parts milk and cream, so you can mix them together if you can't get half and half where you live. Hope that helps. That's so helpful. Am gradually building up a list of US v UK ingredients! Note to self: never visit this blog when I'm having the mid-afternoon munchies. Looks absolutely delicious. I tried this recipe the other day and it was delicious! However, I only had one box of shells, so there were a lot of leftovers the next day. 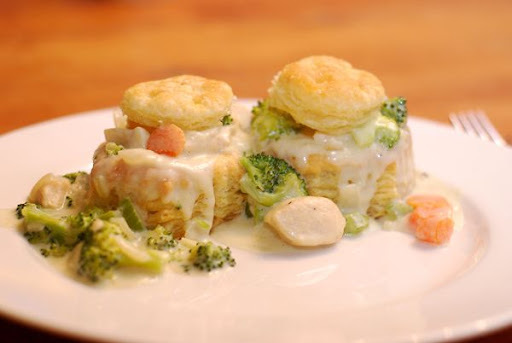 I did have a box of regular puff pastry, so the next night i used the leftover chicken mixture, added a little cream of chix soup and milk to make it a little creamier, put it in a cassorole dish and put the pastry on top for a "Chicken Pot Pie". Made some mashed potatoes and it was like having a new meal! My husband thought I'd been slaving away in the kitchen for 2 days, not even realizing I was using leftovers! Thanks for the recipe!